Five generations and more than 100 years separate Jakob Obexer—who emigrated from Austria in 1906 at age 20—from Jacob Fields, a seven-year-old now running around the marina that his great-great-grandfather established. “There’s not a day that goes by that I do not feel blessed to be part of a family that is so rich and deeply rooted in Tahoe’s history,” says Sarah Obexer-Fields, Jacob’s mother and current owner of the Homewood-based Obexer’s Boat Company. Jakob Obexer, known as Jake or J.P., traveled from his home of Bozen, Austria, to New York on the Philadelphia; he worked his way across the country to San Francisco by waiting tables. Rumor has it that he first viewed Lake Tahoe in May 1908, when he assisted with a large catered gala (though, he was quickly fired when he engaged the staff in a game of dice using sugar cubes). His infatuation had begun, however, and he became determined to move to this beautiful spot. During that time, Obexer spent summers at The Lake. In a report by local historian Carol Van Etten, Obexer worked in the commercial fishing business, but was frequently arrested for infractions. After multiple run-ins with the law, Obexer gave the judge a deposit and told him to just withdraw the fine for every subsequent citation. He began working in the petroleum industry, becoming a distributor for the Standard Oil Company of California (thus earning the nickname “Mr. Red Crown”). Barrels of oil were dropped off in Tahoe City; Obexer would load them onto his boat, Pickle, taking them around The Lake to his clientele. One such customer was the infamous Walter Scott Hobart, Jr. (who supposedly had a ravenous appetite for food, drink and women). Hobart’s summer compound in Homewood happened to be just two parcels from a family named Williamson, whose daughter, Norma, Obexer began courting. They were married in 1916 and welcomed a son, Herb, in 1921. “In 1922, he purchased his Homewood property,” says Hadley, adding that Obexer became Homewood’s first postmaster as well, a career his daughter-inlaw would later take over. Here, Obexer launched his boat business, becoming the local rep for the Gar Wood Boat Company in 1928. Clients included Arthur K. Bourne, heir of the Singer Sewing Machine fortune, and John Brockway Metcalf, who owned Tahoe Tavern Heights. 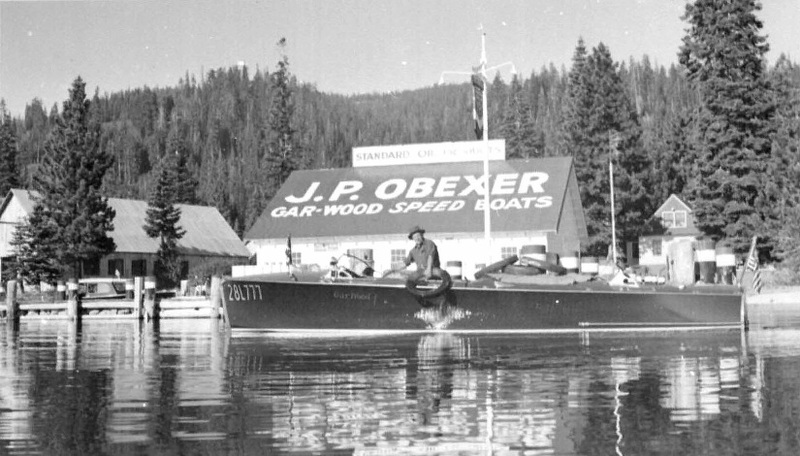 Obexer bought his own Gar Wood, Miss Tahoe, in 1939; the boat can still be seen at the Tahoe Maritime Museum. In 1931, a fire destroyed part of the entrepreneur’s marine pier when his runabout exploded upon ignition (one of many close calls). The smooth talking Austrian approached the president of Standard Oil Company, which had participated in the pier’s construction, and explained that it was the company’s portion that had burned. “He was a great saleperson and a great storyteller,” Hadley says. “He was larger than life to a lot of people.” Obexer successfully convinced Standard to pay for the reconstruction. He also established a new commercial building, to include the post office, grocery, meat market, soda fountain, beauty shop and several upstairs apartments. Obexer’s son Herb returned to help his father run the business following a stint in the U.S. Navy during World War II. Herb married his sweetheart, Edna, a former Navy nurse, and they welcomed their son Jakey in 1948. During the 1950s, Obexer and Herb grew the business, becoming dealers for Higgins and Mercury boats, increasing storage capacity and constructing a marine chandlery. It was smooth sailing until 1975, when Jakey died in a boatyard accident, leaving his wife, Penne, and six-month-old daughter, Sarah. Less than a year later, Jakob Obexer died at the age of 89, his wife following just two years later. Despite the tragedies of the 1970s, Obexer’s Boat Company remained in the family. Herb died in 1985, leaving Edna to run the business. Sarah joined Edna, her grandmother, at the helm following college. Edna passed in 2007, leaving behind Sarah, her husband, Keith, and their two small boys, Jacob and Kaleb.